Living a simple life happens in many forms, but for us, it means relying on ourselves for everything we need. 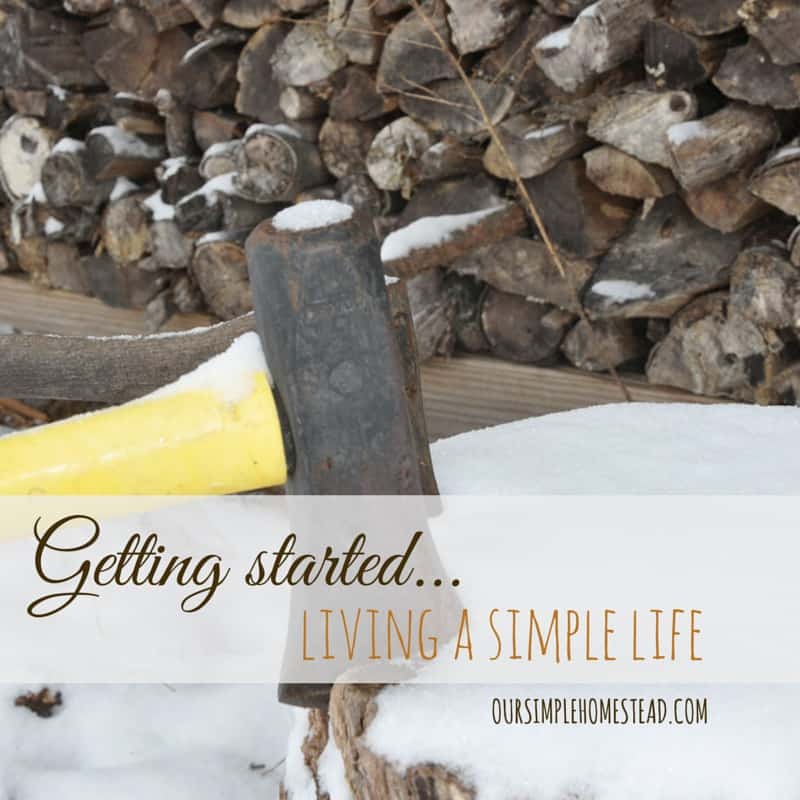 Hubby and I spent a day chopping and stacking firewood last week, and while we were working quietly together I got to thinking about how our lives have changed. Just six short years ago we were running the same rat race many Americans are today. We were working 60 hour weeks, trying to pay for things we didn’t need. A big house, too many cars, and large credit card debt resulting from the must-have mentality we were living by. Was it easy to break the cycle? You bet it was and it didn’t come without sacrifices along the way. 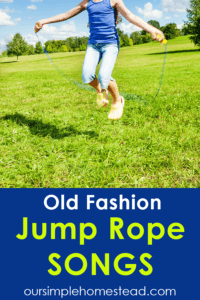 Gone are the days of designer clothes, expensive dinners, and long vacations. 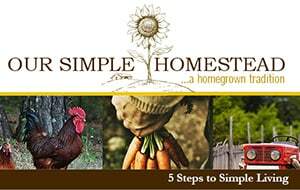 Now our life consists of home-cooked meals, a full pantry, farm chores, budgets and a never-ending to-do list. But, most of all it comes with an overwhelming sense of peace. Just knowing that we can take care of ourselves means more to us than anything we could ever buy. 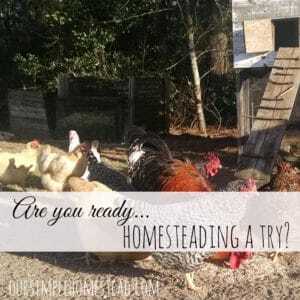 To know we can raise our own meat, stock our own pantry, eat our own farm raised eggs, reuse and recycle everything we possibly can, and even make our own form of entertainment is a dream come true. 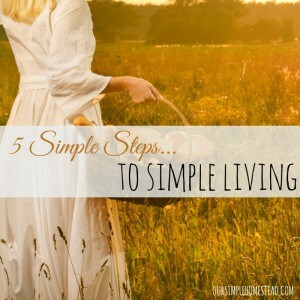 Living a simple life came easily to us since we both wanted it so badly and most of all we wanted to take back control of our lives. I remember in the very beginning we had to start small. 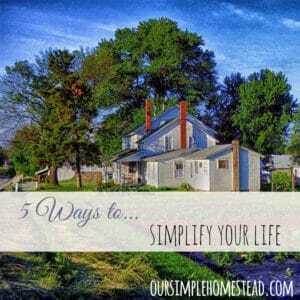 We had to find ways we could simplify our lives while we looked for a way to change them in bigger ways. We changed our mindset. – We were stuck thinking that the only way we could live simple was to move to the country. 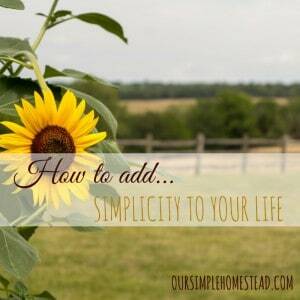 But, what we realized is we could live simple by just making a few small changes in our everyday life. We stopped relying on Walmart to provide for our everyday needs. 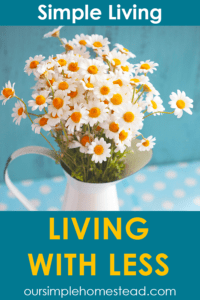 – We started small….I learned to make bread and homemade cleaning supplies. We gave up boxed foods. – By learning to cook at home we broke away from the prepackaged, unhealthy foods, and made the switch to good wholesome real food. While I was still working I, utilized my crock-pot and planned ahead to stop the ready-made food crutch we were on. We learned where our food came from. – We started shopping weekly farm stands and farmers markets. We got to know the farmers and produce growers in our area and started buying from them. Learned the difference between a want and a need. – One of the biggest hurdles for us was knowing when to tell ourselves NO. We were so used to buying whatever we wanted whenever we thought we needed it. In most cases that led us to charge items we thought we couldn’t live without. We took inventory. – We stopped and took a good look at our life. We needed to determine what areas we had lost control of. For us, it was our work schedules and spending habits. Once we figured out those specific areas, we went to work creating a simple plan to tackle them. Your list may look different, but please know that life is what you make of it. It doesn’t matter if you live in the city or in the country you can find a balance in your life by learning to take care of yourselves and stop relying on others to take care of you. If all the big box stores closed tomorrow, could you provide the basic needs for your family? We probably will never be able to raise our own meat but we are doubling the size of our garden this year and we are planning to get chickens for eggs this spring. Couldn’t agree with you more. It’s so gratifying to know that we are providing for ourselves, instead of relying on others to take care of us. It’s nice to have friends and neighbors to share things with, but it feels good to know that we don’t have to compete with others for happiness to invade our lives. We are kindred spirits! We are great neighbors as well and we get so much joy in sharing our bounty with them. Hi everybody,Happy New year to you all and enjoy ready your article. You are lucky to keep animals whereas in Kitchener, Ontario we are not allow to keep small animals like chicken unless we move to village. Thanks for the bread recipe. I am going to try your’s. I always make my breads and enjoy them and never like store bought. Keep up the good work and enjoy your website. Your words couldn’t ring any truer for me! I know that living without debt brings peace. Hard work brings a good night’s sleep. Self-sufficiency brings satisfaction. What more could a person want? Funny, I can’t help but believe we somehow came from the same gene pool! The more I talk to people the more I realize we all want the same things…to live a simple life and put in a good days work. I am finding that simplicity comes with age I think. You are so correct! Your mindset does change as you get older. 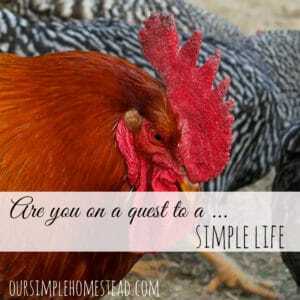 I would have never dreamed 15 years ago that we would be homesteading, living on so much less and being ok about it. I thought as I got older we would be living the American dream of traveling and buying whatever we wanted. Boy was I wrong and glad I was!! I love the ideas I find here. 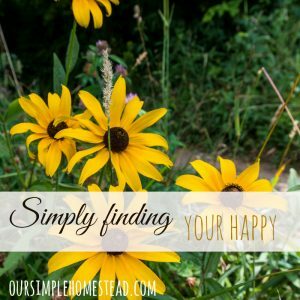 We, too, are feeling called to simplify many things about our lives. Down-sizing is one thing we are really focusing on in this new year. We have already donated many items and have so many more to either sell or give away. It is making us feel better already! Sometimes more stuff can equate to more stress. Thank you for your wonderful blog and for sharing your journey. It is very inspiring to us who want to live a simpler life in this modern, fast-paced world. God bless you. 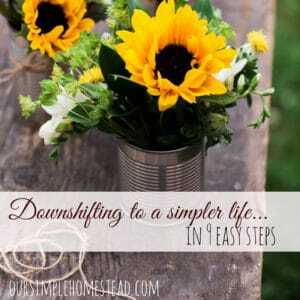 I know when we started to downsize and get rid of all the extra clutter we had our life really started to change. Things that we thought meant so much were really just causing us undo stress. Thanks Angie for taking the time to let me know enjoy reading about our crazy simple lifestyle! I love how you broke this down into easy, attainable steps! I heartily agree, Tracy. Angi my brain functions best if I break things down in doable steps and I am glad to hear others think the same way!